Nothing beats freshly squeezed. Just cut in half (see slice it) and press using your manual or electric juicer. Florida citrus are full of juice, yielding up to an 8 oz cup per one fruit. It's not only tasty; it's better for you than store-bought which has higher sugar content and less fiber. A new way to eat a tangerine! Not very conventional but pretty practical, unrolling your tangerine takes a few short steps. First, cut off the top and bottom of the tangerine. Make sure you don't cut too far in, so that you just barely cut into the flesh. Cut one slit into the skin (again, don't cut into the juicy flesh!) and gently roll the tangerine out into a strip. Simple as that! Slice the grapefruit in half (see slice it). Using a sharp serrated knife, or grapefruit spoon, cut around each section where the pulp meets the pith. Grab a spoon and dive in! If your grapefruit half is too wobbly for your liking, take a small slice off each end of the grapefruit so that it sits flat. Slice off the top and bottom of the fruit with a knife, aiming to cut through the peel and pith, just barely exposing the pulp. Next, cut off the outer peel in the same way until you have yourself a naked fruit. Now, insert your knife blade between the flesh of one section and its outer membrane, and gently cut to the core of the fruit. Once the blade hits the center of the fruit, rotate the blade towards the other side of the section and let the cut section fall into a bowl below. It’s messy (because its juicy), but its quick and yummy. First, slice off the top and bottom of the fruit with a knife, cutting through the peel and pith, just barely exposing the pulp. Cut away the rest of the peel and pith from the fruit until you have a naked citrus. Then add to a smoothie or homemade salad dressing (check out our recipes) so you can utilize as much of the fruit as possible. Eat up! The zest of citrus is the outermost, colored skin that contains yummy, flavorful oils. Hold the fruit still and move the grating tool of your choice back and forth across the peel. Be sure to take off just the colored part of the peel, if you've cut into the white pith, you've gone too far. Pictured above is a grater but you can also use a zester for larger pieces or use a vegetable peeler for for tangerine strips. Peel the skin and eat it like an orange. It’s the best way to get the most amount of nutritional value. Yep, that white pith (between the pulpy fruit and the yellow skin) is packed with fiber as well as valuable bioflavonoids and other anti-cancer agents. For easy peeling, use a knife to score the peel (and just the peel, don't cut too deep!) into quarters like a basketball before peeling with your fingers. If you plan to use your Sweeter Sorts fruits right away, or within a couple days of purchase, then you can store them at room temperature. When stored at room temperature, they last about a week. The better option when you plan to use the fruit at a future date. Keep them in the crisper drawer for the best results. 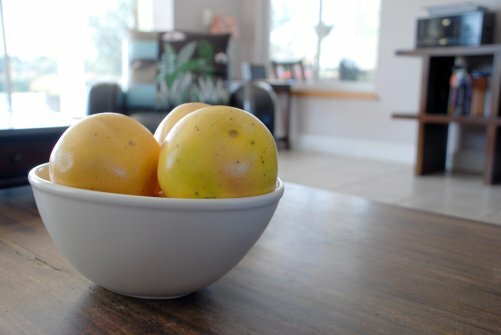 The fruits typically last 3 - 4 weeks when stored in the fridge.